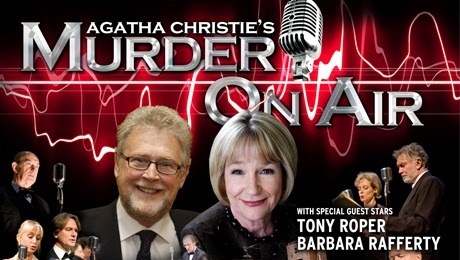 The pair will perform as part of the highly acclaimed Agatha Christie Theatre Company as they return with a week long runof Murder on Air at Glasgow’s Theatre Royal. On each date of the Company’s UK tour two other special guests will take on Roper and Rafferty’s roles, but how glad we are to see the Glaswegian duo together again. The Company will bring to the stage a unique set of three plays originally broadcasted by BBC Radio during the 1930s. In its nine year history, the Company has adapted many of Christie’s back catalogue to the stage from Poirot’s The Hollow to 2013’s Go Back For Murder. This radio adaption is a unique fleet for the Company that they previously performed in 2008. The three plays in the trio will consist of: Butter in a Lordly Dish, Personal Call and Hercule Poirot’s The Yellow Iris. Even the most avid of Christie fans might not recognise the former two. In fact, Butter in a Lordly Dish was only broadcasted on air twice in the span of three days. A recording of the broadcast doesn’t even exist. Also, The Yellow Iris was adapted from Christie’s short story ‘Yellow Iris’ and it was the first time the famous sleuth was presented on air. With this range of an obsolete Christie tale to a Poirot mystery, it is sure to be a diverse experience for everyone involved, especially the actors who bring the characters to life: “The plots are so wonderfully interwoven and place a high demand on the performers to bring the audience into her world,” Roper said praising Christie’s craft as a writer.